This is the eighth of an occasional limited run of cheeky seaside postcard subjects specially commissioned from one of the best modern decorators of ceramic ware, previously the chief decorator for Carlton Ware and now commissioned to produce these vases exclusively for Artware Collectables. This one, as can be clearly seen, shows the amusing scenario reminiscent of the Saucy Seaside Postcards entiled, "I Don't Work Mondays " much beloved of an era now passed by. 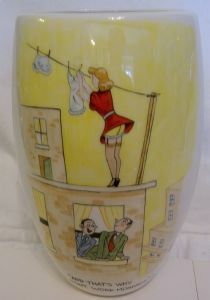 This shape of large Vase has proved very popular over time being big enough to show off the picture in some detail. It measures some 7.5 inches (19 cms) tall. The picture is freehand painted by Tony Cartlidge who is highly respected in this style of modern decoration whilst keeping the traditional aspects within the picture. The base is backstamped appropriately, signed to the rear and is in perfect condition. As with all Artware Collectables products, this item is 100% Made in England .